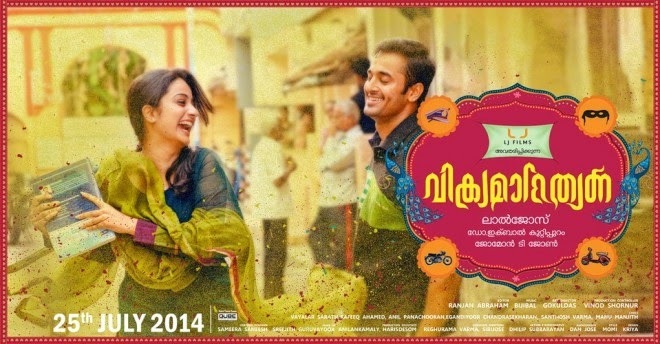 Directed by Lal Jose, "Vikramadithyan" is a movie that has all the “right ingredients” for a ‘crowd puller.’ The star cast has Dulquar Salmaan, Unni Mukundan, Namitha Pramod, Anoop Menon, and Lena, among others. To me, it felt as though the real lead actors of this movie are Anoop Menon, Lena and Unni Mukundan – their performances, timing and dialogue delivery are excellent and memorable. Their characterization is well-fleshed out and has both depth and consistency from start to finish. I liked the starting point of "Vikramadithyan" as it unfolds a realistic love story that fails between Vasudev Shenoy (starring Anoop Menon) and Lakshmi Nair (starring Lena), who are police officers but don’t end up marrying each other as they wished to. Lakshmi gets married to another man who woos her by pretending to be a spunky police officer and Vasudev Shenoy marries another lady from his community. Both the couples have sons who are born at the same time and are named Vikraman (Unni Mukundan) and Adithyan (Dulquar Salman). The story of conflict and competition between the two boys begins here and it intensifies as they grow up and fall in love with the pretty Deepika Pai (starring Namitha Pramod). Vikraman and Adithyan are ‘rivals’ with opposite backgrounds. Vikraman has a more protected and pampered upbringing than Adithyan. He has the confidence of a boy who comes from a good family and is well brought up, disciplined and ambitious. Due to a difficult childhood, Adithyan grows up without a clear sense of direction and parental guidance. He has anger and it turns destructive. Vikraman aims to be a police officer like his father, so Adithyan wants to beat him to it. It doesn’t help that the love of his life – Deepika – keeps egging him on by relentlessly praising and comparing him to Vikraman. All the odds are in favour of Vikraman but there’s an element of surprise in the film which you should watch to find out what it brings. It’s a good twist and not one you would easily predict. Deepika’s characterization is a serious flaw in this movie. It is grainy, inconsistent and irritating. She is portrayed as a girl who is shown to be from a conservative Shenoy family in Mattancherry but with a modern outlook. For a very independent thinking girl, her actions are not convincing. She constantly compares the two guys to each other in her actions – which seems like petty behaviour to me – but she calls it a sign of friendship (it’s more like confusion). When her best friend asks her to marry him knowing well she is in love with another guy, she sends a mail first informing the guy she loves that the other guy has beaten him to it and then by asking him to make the decision for her. Again, at a critical juncture, instead of telling Vikraman that she doesn’t want to marry him, she simply plays the ‘silent, helpless damsel in distress’ and finally Vikraman takes the most important decision in her life for her without even asking her! On top of all this, she is constantly wedging into the relationship between the two guys – for what? Namitha’s dialogue delivery seems forced instead of natural, her body movements are graceful but there is a clear lack of chemistry with both heroes. The depiction of growing up in Mattancherry – with its narrow alleys, schools, the TD temple and the cultural landscaping of several communities living there such as the Shenoys, the Pais, the Nairs, the few Gujaratis – the cultural atmosphere is deftly captured. All the sequences showing Anoop Menon and Lena are commendable. You know you are watching two veterans with a great sense of timing. I particularly liked the actor who acted as Lena’s husband. His role is small but has tremendous impact. His personality comes through and stays with you throughout the film. 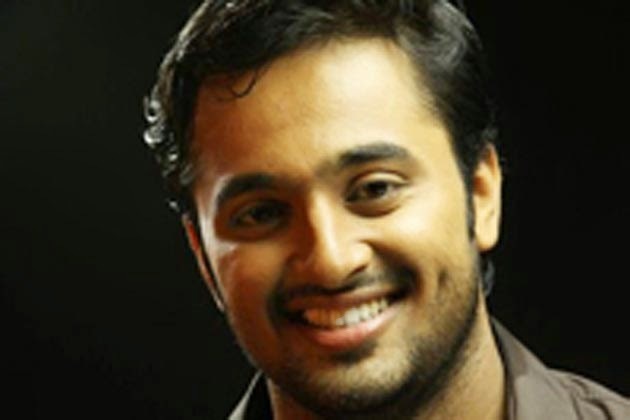 Unni Mukundan is not the hero of this movie but on screen, he steals Dulquar’s thunder and lightning. Dulquar struggles and pales in all scenes where Unni Mukundan is present. I liked the way Dulquer is constantly experimenting with his attire and his body language is always in sync with the nature of the character he presents. Dulquar reinvents his appearance in every movie. "Vikramadithyan" follows the ‘film masala’ formula perfectly but I feel it’s a “let down” movie with over rated publicity. The first half of the film seemed to be dragging pointlessly. The second half brings in the best part of the movie, thanks to several badly timed surprises mixed with bittersweet moments. It is disappointing to see a director like Lal Jose come up with a movie like this. Go watch it if you want to waste time – I won’t recommend it though. NGDCs .. But your descriptions seems good enough tempting me 2 go and see this movie 2oo .. I was thinking about watching some new movie like "Kick" probably and now there seems one more choice with ur interest invoking write up .. Given that I am a crazy fan of DQ and Lal Jose, I will anyways go ahead and see this movie despite the thumbs down you have given it. if a movie is a no-brainer comedy, then it can be enjoyed in that way. but this movie is trying to show a serious theme without any sense and too much of coincidences.. though actors are gud.. some thing is wrong.. bad direction or its bad screenplay..
NGDCS .. just a connected funny share too .. :) ..
I’m From Tamil Nadu, I like Malayalam Movies very much, in contrast I heard many Malayalam people like VIJAY, AJITH, SURYA, ALLU ARJUN. Tollywood is completely opposite to molly wood, whereas kolly wood is mixture of both the tolly wood and molly wood. Movies Made by Malayalam Industries are heart warming and life oriented, where you can at least learn something for your Life. I wish People from Malayalam film industry release their movies in Tamil with subtitles so that it will reach wider audience. Because artistic work should reach more people in the world. I used to read all theMalayalam Cinema News, Mollywood News, Gossips from this site, check it , would be useful.